Sight is not the same as vision. “Eyesight” is the physical process of focusing light within our eyes, whereas “vision” involves our ability to understand what we see. It is estimated that 80 percent of learning in both children and adults takes place through the visual system. A child who has 20/20 visual acuity according to the Snellen test does not necessarily have good vision. The eye chart used by most schools and doctor’s offices for visual screening assesses the ability to identify letters at a distance that a normal child would be expected to see (usually about twenty feet). Did you know the Snellen test does not identify problems in the following areas? Near focusing. Most learning is done within arm’s length, such as by reading from a book or working at a desk. Eye coordination (binocularity, the ability to blend images from both eyes). Each eye sees a slightly different image, and the brain fuses the images into one three-dimensional picture. Eye movement and tracking. The eyes need to work as a synchronized team and stay on target. While statistics show that vision disorders are the number one handicapping condition for children, the Snellen test identifies distance-vision problems in only five percent of children. Good eye coordination is a skill that must be developed, which means that vision can be learned at any age. One out of every four children struggles with reading and learning because of undiagnosed vision problems. Problems with attention, reading, and learning are just a few of the symptoms that can be improved when vision disorders are found and treated appropriately. Early detection can save years of struggling. Any of the above symptoms may be a sign that a child is struggling with a vision-related learning problem. Fortunately, through vision therapy, many such problems can be corrected. Vision-related learning problems affect the way a child’s eyes work with each other and with the brain to collect and interpret visual information. They can be as simple as an inability to see close-up (usually an eye focusing problem) or as complex as a cognitive inability to interpret what their eyes are seeing. Some children may have convergence insufficiency, which is a problem with how their eyes converge. In many cases, a child’s visual abilities are not sufficiently developed to enable them to learn to read effectively. Unfortunately, children with vision problems usually do not tell a parent or teacher they have a problem. They do not realize they are supposed to see letters, numbers, objects, and the world in a different way. In fact, most children with vision problems do not complain because they think everyone sees the same way they do. Research indicates that the problem can be due to a difficulty in either acquiring or processing the information we receive through our eyes. The visual skills needed to see effectively may be lacking, or the brain may not be sufficiently trained to interpret what the eyes see. Without these abilities, the child spends too much energy just looking at the written word and decoding it, leaving little mental energy to comprehend and remember the word’s meaning. Many children diagnosed with Attention Deficit Disorder (and labeled as candidates for drug treatment) have not been properly evaluated for visual problems. What may appear to be a lack of interest in reading and schoolwork may actually be an inability to keep their eyes properly focused on their books. These children become easily distracted and may appear to be hyperactive. Over the past two decades, the diagnosis of ADD/ADHD has become epidemic. Before labeling a child as suffering from a psychological disorder such as ADD, ADHD, ODD, PDD, autism, or learning disability, it would be wise to evaluate them for developmental problems in areas such as visual development, motor development, and auditory development. Convergence insufficiency is the most common form of a binocular vision problem. It occurs when the two eyes do not turn in correctly. When we read, our eyes have to turn in and point to the same place on the page. If one eye does not line up with the other, it can cause problems with reading, such as loss of place, loss of concentration, reading slowly, eyestrain, headaches, blurry vision, or double vision. 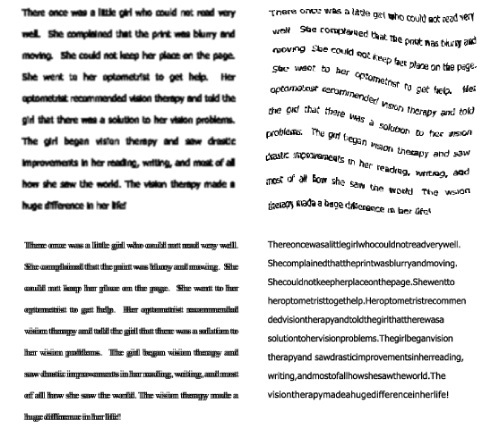 The following page shows a few representations of what it might look like if you had a vision-related learning problem. A child with an undetected visual problem is often accused of having a short attention span and told that they can do better if they try harder. The child soon learns that no matter how hard he or she tries, success is not possible. Consequently, the child soon gives up academically and must find other ways to occupy their time. Unfortunately, most of the alternatives are not socially acceptable in a large classroom. Human nature dictates that what a child does not do well, he would rather not do. The answer does not lie in stricter discipline and regimentation of these children, but rather in making a stronger attempt to detect and correct their underlying visual problems with the proper lenses or vision therapy. Visual perception: the ability to tell the difference between letters, numbers, etc. If my child is having problems in school, how long should I wait to contact you? Did you know … one out of every four children has a vision problem that may cause poor progress or behavioral difficulties in school?